Anthias are members of the family Serranidae. Several different genera comprise this family including; Pseudanthias, Nemanthias, and Serranocirrhiti. All are collectively referred to as anthias. The anthias most familiar to saltwater aquarium owners belong to the genus Pseudanthia. There are several species within this genius. This article is meant to be a generalized description of the genus. Anthias inhabit all the topical oceans and seas around the world. These are considered the quintessential reef fish and often account for the majority of the fish population swarming around tropical reefs. Anthias are typically among the smaller more docile fishes made available by the saltwater aquarium industry. These are extremely popular ornamental fish because of their intense and varied coloring. 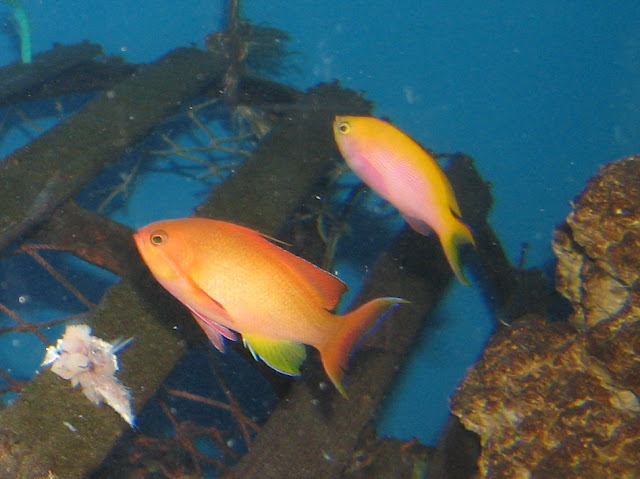 Common color variations found among Anthias include pink, purple, orange and yellow. They will live an average of five years but have been known to live as long as eight. Anthias are generally considered hardy fish in their natural habitat but they have been known to have problems adapting to a life of captivity. They are quite often traumatized to the point of not bothering to eat. They have frequently been known to starve themselves to death. It is strongly recommended that you ask your fish store to watch them eat before purchasing them. If they are feeding they will be more apt to acclimate to your aquarium. Live food will often aid in the acclimation process. These are a shoaling fish. In nature they congregate by the thousands very often schooling in larger populations. There are innate subdivisions within these schools typically referred to as harems. Harems have a hierarchical order. This hierarchy is comprised of one dominate and up to two subdominant males. Subdominant males are generally smaller and less colorful. And what is a harem without a female population? There are often as many as twelve females populating the harem all of which have their own hierarchy. Anthais are considered good additions to a community tank. They are "reef safe" and are accustomed to living with a variety of other species. They range from 1.5 to 5 inches depending on their particular species. The size of a specific species should be inquired about to select suitable tank mates. You want to raise them with other mild mannered species. Despite their inherent nature to live in communities a single Anthais can be added to your tank. However several will allow you to watch them act as nature intended. A new arrival will often adapt to unfamiliar surroundings if you already have an established anthais community in your aquarium. Unless you have a very large tank you will want to have a single male to avoid territorial issues. However a few may establish a social order. A harem of females is appropriate when raising theses fish in a community. Anthais prefer subdued lighting. They are hiders by nature and should be provided with plenty of plants, rock work or hollow aquarium décor. Anthias are dither fish. They communicate with each other. They will warn each other if there is danger approaching and then issue an all is clear signal once the potential threat has passed. Anthias are protogynous hermaphrodites. All species are born as females. If the dominant male of the harem perishes this event will often trigger a hormonal response in the largest female transforming her into a male. This can lead to aggressive behavior between the two. The dominant male views the largest female as his potential replacement, while the largest female's body is surging with testosterone because of her rank in the harem's social structure. Anthias are Zooplankton feeders. Zooplankton are microscopic organisms that float in the oceans and seas of the world. They typically float in columns. These columns are inhabited by crustacean larva, and extremely smaFll crustaceans like daphnia, and radiolarians. Zooplankton can be purchased commercially. Anthias can also be fed vitamin enriched brine shrimp, other varieties of tiny crustaceans as well as frozen protein enriched food for marine fish. Anthias are active fish with healthy appetites and should be fed at least three times a day. The popular anthias family sees three of its species carry the torch in the marine aquarium hobby. They are the Lyretail Anthias, Dispar Anthias and the Purple Queen Anthias. No other Anthias is as popular as these three. Among them however, the Lyretail Anthias is the most popular. They are especially social fishes that are ordinarily found in some of the largest numbers in the wild in areas where water flow is very high. Groups upwards of a 1000 are not infrequent as they swim through the water flows in spots where there is regularly a abrupt decline from the reefs. They are located all the way through the Indo-Pacific and are a exceptionally widespread marine fish in the marine aquarium fish trade. Their scientific names are Pseudoanthias Squamipinnis and are one of the cheaper members of the genus Pseudoanthias. Costs regularly extend from $15 to about $30 per fish. Males almost always fetch a greater price compared to females. A male will usually have power over a harem of numerous females. In captivity, the rule of thumb is to keep no more than one male per aquarium. Putting two males together will result in extremely hostile behavior until one finally perishes. While most people decide to buy this fish with the aim of forming a big group in their aquariums, a large amount fail merely because they do not have a large enough aquarium or a big enough group. The separate sexes have surprisingly diverse coloration. Females are frequently hues of orange while male lyretails are red. They are hermaphrodites that start off life as females and have the capability to turn into males in appropriate conditions. This is very much like Dwarf Angelfish. Smaller shoals are incapable to properly disperse and absorb the hostile character of the males. As the lyretail anthias is an open swimming species that can achieve a length of about five inches, they need larger tanks. The bare minimum needed to keep these jewels is a 100 gallons. However, larger tanks more than two hundred gallons are recommended if a small group is desired. On the whole, Lyretail anthias are one of the more hostile kinds within the family and must only be housed in bigger fish aquariums. Too often to people get trapped into thinking they can safely house a small group in smaller aquariums only to see them perish one by one. Always ensure they are well fed in captivity. Although the Lyretail Anthias is a attractive and fairly low-priced member of the Anthias family, they can be pretty aggressive and can harass smaller aquarium mates. 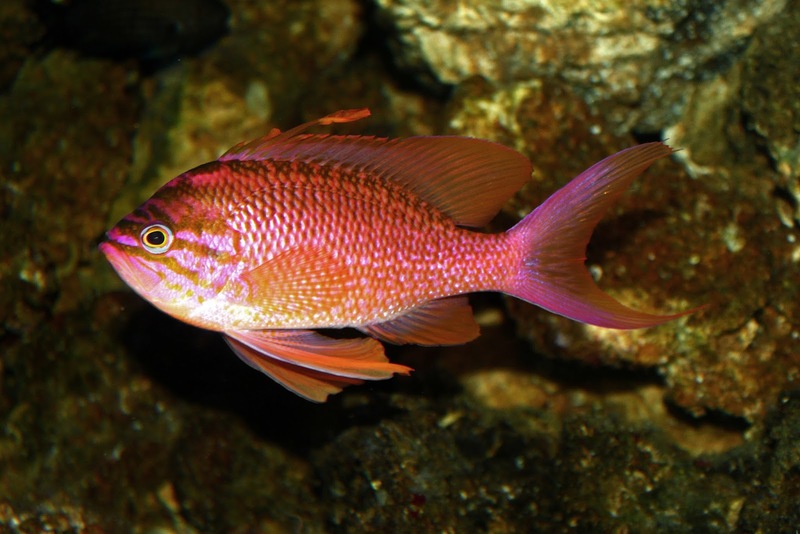 After they are familiar with their new environment and are eating prepared foods, they are a resilient saltwater aquarium anthias. Anthias fish are a grouping of small marine aquarium fish which are located in roughly all tropical oceans. They are typically some of the brightest colored marine fishes in the ocean and are especially admired additions to the saltwater tank. They come from the family Serranidae that have mostly basslets as well as groupers. In the basslet family, they are classified in a sub-family named Anthiinae. There have been seven discovered types among this subfamily so far. Anthias are mainly a shoaling species that can occasionally be found in the thousands throughout their usual habitats on the reefs. They are customarily found living in areas of exceedingly high flow, something that ought to be replicated in the home aquarium. Roughly all anthias types feed on saltwater plankton during the day. This fact makes these stunning fish fairly tricky to house in the aquarium. Some do exceptionally poorly in captivity and reject prepared foods until they finally starve to death. Multiple feedings of small foods need to be available every day. A few good selections are made up of cyclopeeze as well as grinded meaty seafoods. Feedings more than of three times each day is recommended. If such a feeding timetable cannot be offered, it would be best to shop outside of the anthias family of fish. Anthias are located at depths anywhere from twenty feet all the way as deep as 200 feet. Deeper dwelling anthias regularly command a incredibly expensive price and are almost always sold immediately when available. Two recognizable and pricey deep dwelling varieties are Pseudoanthias Ventralis and Pseudoanthias Privitera. Also included in the Anthias fish family are various distinctive oddities such as the highfin perchlet. Commonly confused as a hawkfish, they come from the genus PLectranthias. Like hawkfish, the highfin perchlet does not have a swim bladder. All anthias fish are sequential hermaphrodites. Large shoals are regularly made up of a greater number of females than males. These fish have need of large fish aquariums to do well. If more than one specimen from a species is required, make certain there is only a single male present. Adding males in captivity will almost always bring about aggression. On the whole, anthias fish are thought of as a fairly modestly priced saltwater fish outside of the uncommon deepwater types. Prices range anywhere from $20 to $40 per specimen based on species. exceedingly colorful, most lovers attempt to replicate their shoaling behavior in the aquarium. However, only those with the largest marine aquariums are successful. For further information on the Lyretail Anthias do drop by the authors website. All manner of popular marine aquarium fish are covered including the popular clownfish, dwarf angelfish, surgeonfish and many more.